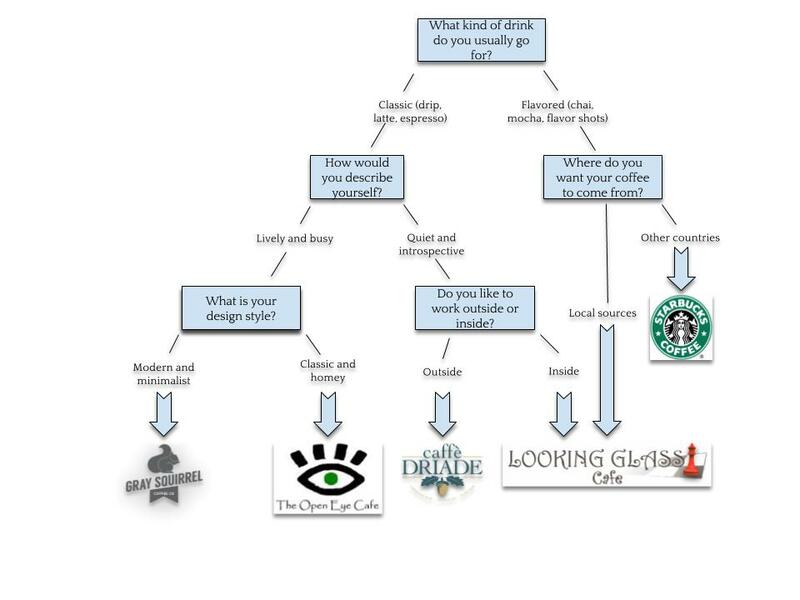 Which Coffee Shop is Right for You? The movie Geostorm isn’t a dark chocolate bar that leaves a bitter taste in your mouth; it’s a carton of milk a few days past its expiration date. You think to yourself, it’s still fresh, I mean, how bad can it possibly be? Then you choke it up immediately. You’re unable to rid yourself of that rancid taste. The movie revolves around a man, Jake, who’s in charge of creating a web of satellites. 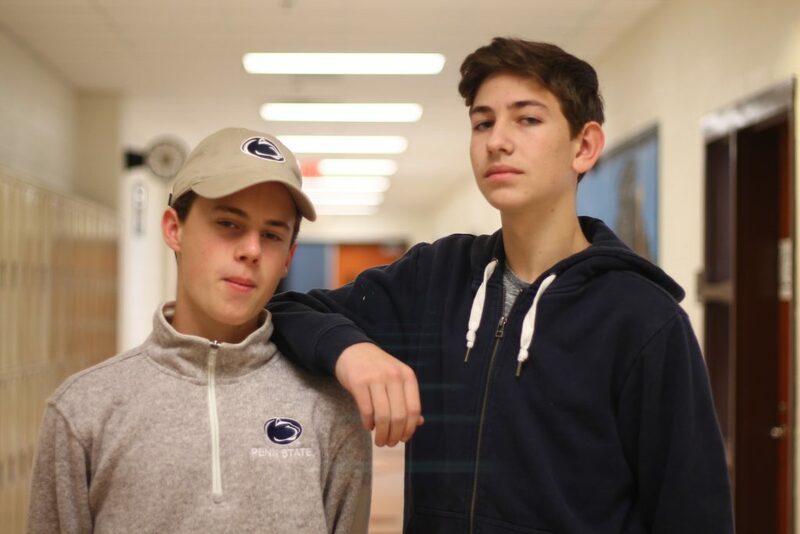 Max, Jake’s younger brother, works alongside him until he fires Jake for ignoring orders. Max then becomes the head of the satellite program, and when the contraption inexplicably kills thousands of people, Jake’s former superiors send him to fix the problem by himself. Jake then ventures to space where he discovers that the United States sabotaged his program from the very beginning. Geostorm’s special effects serve as a comparably nice side to a rotten meal. Waves freezing in place and the many deaths of space voyagers seem convincing enough. However, the rest of the death scenes left me unimpressed. Some of the good-looking explosions did occur in the vacuum of space, which shouldn’t be possible. I guess not even the laws of physics can dissuade a movie’s thirst for explosions, like friction against an unstoppable force. With so much destruction, Geostorm’s tone never matches the ever-increasing casualty count. Random meteorological events freeze, explode, melt and drown thousands of people with nothing to show for their deaths. A thunderstorm on steroids turns half the state of Florida into ash and low-key explodes a building full of Democrats; yet, with all this devastation, everyone just blindly cheers for Jake. Poorly executed scenes on top of bad plot frequently caught my eye. However, some scenes surpass their brethren by doing everything wrong simultaneously. In one such scenario, Max tells his Secret Service waifu she must commit treason. 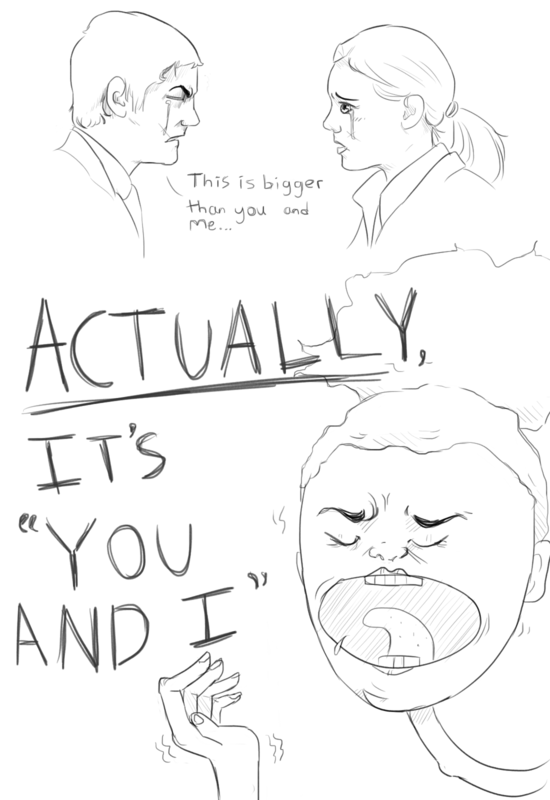 He tells her she has to because “I’m asking you” and “it’s bigger than you and me.” Then, all of a sudden, his secretary in- correctly corrects him by briskly spewing “it’s actually ‘you and I.’” What truly makes this scene the crap of the crop boils down to the two clichés stuffed into one exchange: the prescriptionist secretary who tries to develop herself as a character in a comment that falls flat on its face, and the other stupid lines of dialogue that complete the conversation. Geostorm digs an even larger grave for itself by constantly forcing clichés onto its characters. The actors clearly have a tough time identifying with their character’s unoriginal motives and the generally unrealistic dialogue. Little annoyances here and there slowly started to add up. Jake knowing every little pointless detail about his space web (except for the actual layout of the ship he’s on) really irritated me because they added nothing to his character. The few scenes in which Dusette, the French security guard, and other characters notice the most obscure details only to advance the plot also frustrated me— they completely broke the only moment of immersion the story offered. Is Geostorm enjoyable? Sure. The movie’s pacing did not allow for boring moments though at the expense of critical story elements. If you enjoy awkward conversations that don’t make sense and laughing during the serious parts of a movie, then, by all means, get a ticket. Geostorm could have been more fun if it didn’t take itself so seriously. Had it kept its terrible plot, but refined its characters, it could have been a much different movie. With so little to lose, Geostorm could have easily taken some risks and explored new comedic or philosophical avenues. With its cookie-cutter formula for a crappy plot, the movie crew clearly focused on finishing the movie rather than adding anything to an already heavily exploited genre. In a few years, Carrboro residents will have access to a new library in the parking lot next to Open Eye and Glasshalfull. The Orange County Public Library and the town of Carrboro will share the library with Town of Carrboro employees. There is also the potential for the Arts Center to move some of its programming into the new space. Currently, the Orange County Public library has two locations in Carrboro: the Cybrary on North Greensboro Street and a branch at McDougle Middle School. However, the library wants to expand to a location that better serves the needs of Carrboro residents. Hough added that Carrboro lacks a space with access to public computers―something that the library would add to the town. Plans for the library are still in the beginning phases, with the Town of Carrboro and the Orange County Government deciding on a designer this month. For the last year, both parties worked on a development agreement to discuss how to divide up the costs of the building. The library will replace an 88-space parking lot, raising concerns from both residents and businesses owners. The main concern stems from the lack of parking during construction. Conary explained that businesses will face aesthetic and function issues such as having the view blocked, but he added that once construction is completed, the library could have a positive impact on the town. “There is the potential for this to have a positive long term impact for bringing folks from the county and beyond into the downtown, especially if parking for the public is maintained for easy access to the town and businesses,” said Conary. Two ― because most buildings are repurposed. Now Town of Carrboro is also planning to fix up the area around the library. 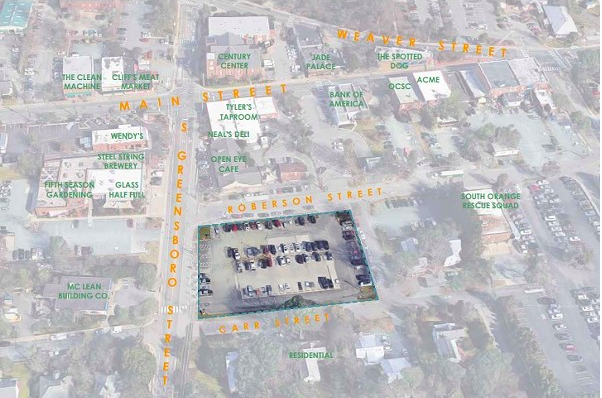 With a completion date set for fall of 2019, the Town of Carrboro and the Orange County Government continue to search for a design that fits the needs and concerns of the community. Q: How long have you been playing an instrument/been in orchestra? Q: What was your inspiration for starting to play? A: I was really into pirates, and I really wanted to be a pirate. I saw the movie Master and Commander, and I was too young to get any of the plot, but it was a movie about pirates and there was a violinist in it, so I was like “Okay, if I wanna be a pirate, I have to play violin.” Also, the movie Music Man is one of my favorite movies of all time, and I used to pretend to be Harold Hill. So, that inspired me to play violin too. Q: Do you plan to continue your musical career? A: Oh yes, absolutely. I mean I’ve been playing for a really long time, where I do a lot with it. I don’t know if it’s going to be my sole profession, but I know I’m always going to play violin. Q: What is your favorite musical memory at Carrboro so far? A: One of my favorite musical memories was our last concert of the year. It wasn’t the best concert, but we did a key symphony piece with all the teachers, so Jester was up there playing tambourine, and the Assistant Principals. Klakovich was nailing the kookoo. He is a musical guy; I never picked that up in class. It was a lot of fun to play that piece with them. Q: Do you have any advice to the freshman or incoming freshman in the CHS orchestra? A: Yeah. Be excited! If you’re excited about something stay excited; don’t let anybody rain down on your parade. Q: Do you have any inspiration for why you play violin? A: I’ve had a few major ones. My violin teacher, he’s been in the North Carolina symphony, he has been incredibly inspirational. One person I worked with over the summer who told me this one quote for music that I probably will never forget as long as I live: “If it looks easy, it’s hard and if it looks hard, it’s hard.” So basically, just everything is hard. And it’s so true, because when you see a piece of music like Barber’s Adagio for String, which is one of the most beautiful things of all time, the notes are easy, everything looks easy, but it’s impossible to do it well. 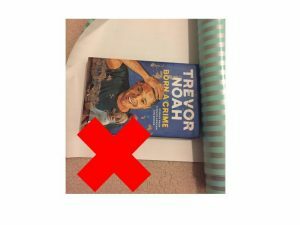 If possible, splurge for a thick, high quality wrapping paper, which will be less likely to tear as you wrap. Also, a dark colored paper with a bold design (unlike the the paper I used!) will usually look best, as it hides wrinkles that naturally occur in the paper. 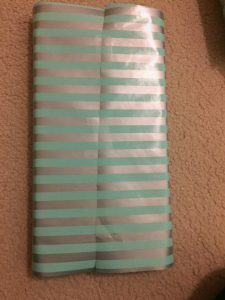 Position your gift so that its longest side is parallel to the longest side of the wrapping paper. 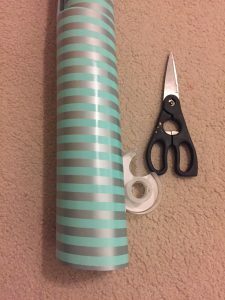 Start to unroll the wrapping paper and gently slide your gift towards the roll, folding the paper over the gift until it is completely covered. Cut across. Do not cut more than an inch away from where the ends of the paper meet. Excess paper will cause difficulties later on! 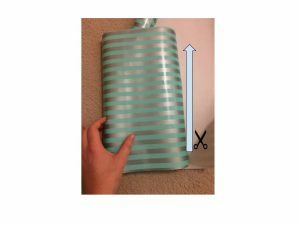 Trim perpendicular to your first cut to create a long rectangle. For a hardcover book, a margin of roughly 1-2 inches on either side of the book is plenty. Leave more room if your gift is taller. Position your gift in the center of the rectangle. 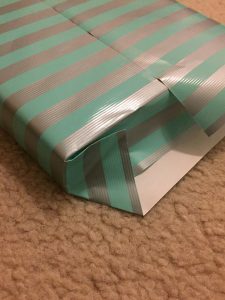 Fold the paper tightly to cover the gift and tape in the center. Also add a small piece of tape on the centerfold at either edge of the gift. This will help prevent an air bubble from forming when you try to fold the sides up! Flip the gift to look at one of the unfolded sides. Hold the top of the gift with your non-dominant hand, pressing down firmly near the edge. Now’s the hardest part. 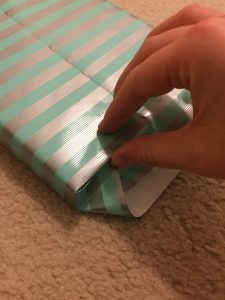 Use your middle three fingers on your dominant hand to gently push the paper down, while your thumb creates a crease at the top of the paper that’s angled slightly towards the center of the gift. 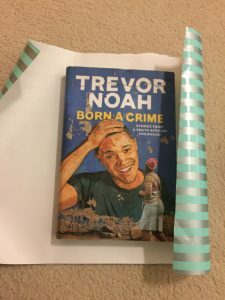 Your thumb should begin at the left corner of the gift, first making a hard fold inwards and then moving outwards along the crease as the rest of paper (guided by your middle fingers) continues to move down. Still with me? This corner is probably the most important part of the whole process — make sure it folds sharply! The aforementioned crease is hidden between my thumb and pointer finger. Push the crease up and to the right with your dominant hand, while you push the rest of the paper down with your non-dominant. 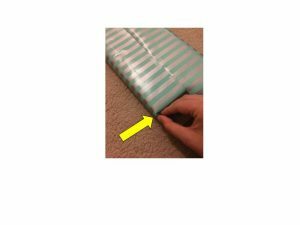 Move the crease towards the gift so that it is flush with the top edge. 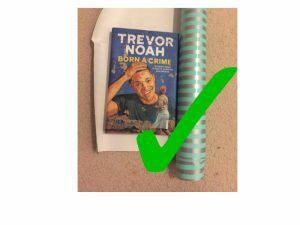 Do not push so hard as to move the gift within the paper. Please note: this is NOT how your hands should look during this step! I needed one hand to take the picture, so here I’m simply holding the crease I already folded. Realistically, your non-dominant hand should be pushing the center of the paper downwards as your dominant folds the crease up. 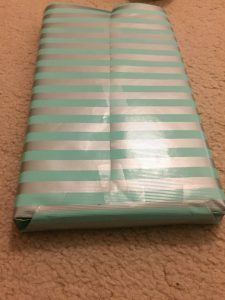 Shift your non-dominant hand to hold the crease in place at the top of the gift. 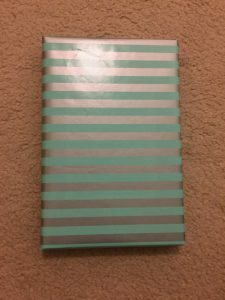 With your dominant hand, fold the bottom left side of the paper inwards, pushing primarily towards the gift, as well as down. Repeat this entire process on the right corner. Get a small piece of tape and hold it on your pointer finger on your dominant hand. Grab the edge you just created with one hand on each side, thumbs on the bottom of the paper and the rest of your fingers on the top (excluding the finger with tape, obviously). Fold upwards, pushing firmly inwards with all your finger, especially the middle ones. 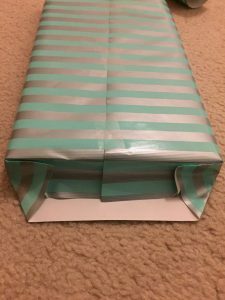 Once the fold has reached the top of the gift, hold it in place with your non-dominant hand. Tape the center of the edge with your other hand. 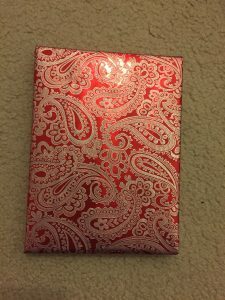 Add another piece of tape along this fold at either edge of the gift. Repeat this step on the other side. The year filled with goodbyes; the year we spend an obscene amount of money to graduate from high school. Everyone is well aware of how expensive college is, but less known are the large amounts of money that have to be dished out during senior year. Every week, it seems, more fees pile onto the price of being a senior. High school graduation should be a celebration of students’ cumulative twelve-years-worth of effort. To attend the ceremony, seniors wear the traditional cap and gown. At their most basic cost, those two items total $58.85, including taxes, shipping and handling. Unless you have siblings of approximately the same height and size, that fee is a requirement for most seniors. The graduation ceremony itself is held annually at the Dean Smith Center. In order for graduation to occur at the arena, seniors contribute to the hefty fee that the CHCCS district pays for the space, as well as all of the printing costs for the event’s programs. The fees associated with applying to college are already extremely overwhelming. On average, seniors apply to six to eight institutions. The application process requires not only an application fee, which ranges from $25 to $90, but each college also requires a transcript — which comes at an additional fee of five dollars per school. Some schools require you to send official test scores from CollegeBoard, costing $13 each. 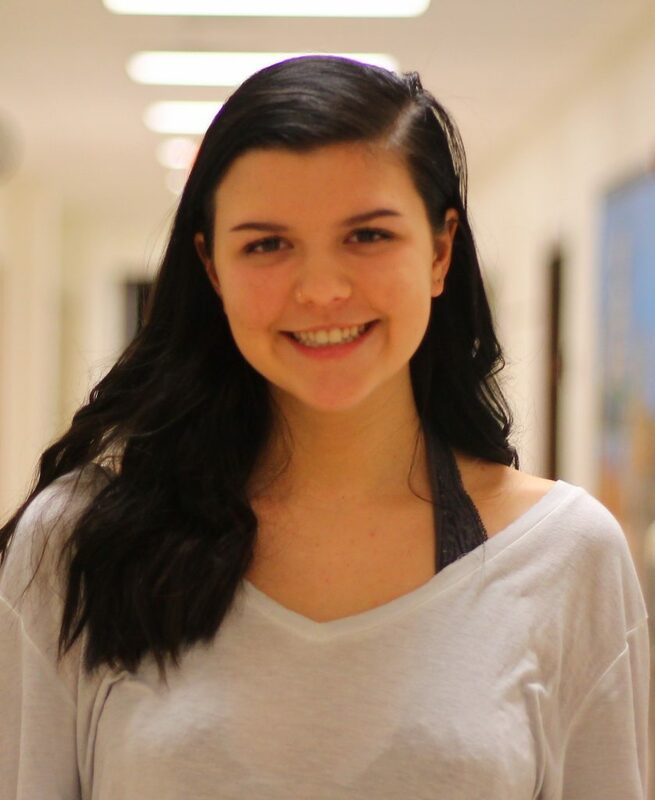 While there is an option to submit tests scores for free at the time you take the test, anxiety sets in and you often contemplate if the score will be good enough or if you even want to attend that institution. Applying to college is already a stressful process in and of itself, add in financial stress, and senior year can become too much to handle. Even after you decide on which college to attend — the place where you will spend the next couple of years — deposit fees add even more financial stress. Used to seal your commitment to an institution, these deposits range in prices from $100-$500. Along with all of the fees associated with furthering our education, there are events and opportunities that you just don’t want to miss out on during your senior year. Dances from T-dance to Prom, for example. But those come with prices of their own; those of tickets, dresses, dinner and more. So do things like indulging in “Class of 2018” paraphernalia; or your last high school yearbook to remember that teacher that gave you three hours of homework and the time you were the star in the spring musical; or simple things like enjoying the last high school rivalry game. All of these fees come secondary to the cost of advancing our education. These are all the things that you would want to reflect back on in 20 or 30 years. The last year of high school is one that you wait for from the time you start kindergarten. You dream of all the perks and privileges of being a senior, but were you really prepared? 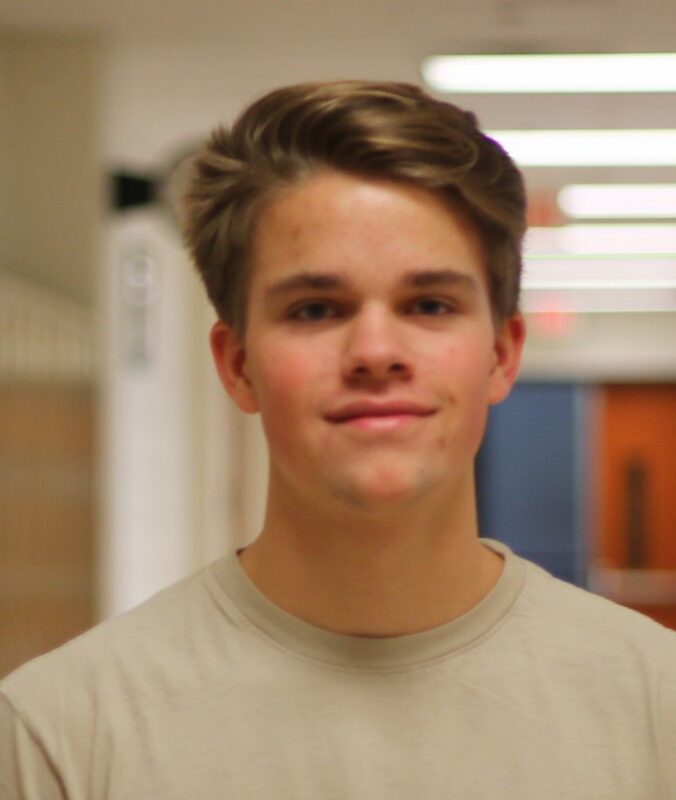 Even if you took rigorous classes, visited colleges and wrote your college essay over summer were you really prepared for the financial commitment? In the silver-wrapped, all-natural corner, we have Spencer Hayden defending Chipotle. Chipotle is the superior Mexican food chain. Its food is of a higher quality, while Moe’s meals often lack seasoning. The flavors and spices used in Chipotle’s food are natural and make its meals taste much better. Moe’s dry and flavorless chicken explains why they overflow their salsa bar with an assortment of salsas to make up for the unseasoned chicken. Chipotle also has a wider variety of meats. They offer delicious options such as barbacoa, chicken, steak, carnitas and chorizo. These meats are more flavorful and better tasting than those from Moe’s. Portion size plays a huge role in why Chipotle is far superior to Moe’s. While Moe’s believes they are being clever by naming its largest burrito the “Homewrecker,” they fail to acknowledge that it is not nearly the size of the average Chipotle burrito (Moe’s burrito weighs one pound while Chipotle’s are one and a half pounds). Though Moe’s does include chips in their meal price, unlike Chipotle, they don’t compare in quality. The chips at Chipotle have a sublime, salty lime flavor unlike Moes’ stale tasting chips. In addition, Chipotle’s guacamole — with its amazing blend of avocados, tomatoes and onions — is undeniably the best you will ever try in your entire life. Although it may be an additional cost, it is 100 percent worth it. Moe’s guacamole is subpar and not worth the extra fee while Chipotle’s is divine compared to Moe’s bland-tasting avocado mush. Also, even though Chipotle’s burritos cost a few bucks more, there is a lot more food inside each burrito at Chipotle. Efficiency also plays a role in determining the best Mexican fast food chain. Chipotle is extremely fast and efficient compared to the long wait common at Moe’s; a wait that comes thanks to employees’ inability to hear customers over their loud grills in the back and their annoying “Welcome to Moe’s” catchphrase. Chipotle stands out in ways beyond their impeccable flavor: their “food with supports local farmers, unlike Moe’s. In February of 2016 they pledged ten million dollars to help local farmers meet their safety protocols. Lastly, Chipotle’s sleek and modern restaurant design is far superior to Moe’s. When one walks into Chipotle’s restaurants, they feel as though they are entering a fine dining restaurant that offers delicious, fancy cuisine. But, when you go into a Moe’s restaurant, it feels as though you are going into a lame pop concert with pictures of old musicians littering the walls. There are endless reasons why Chipotle is the superior food chain to Moe’s, including the quality of food, the design of their restaurants, the freshness of their ingredients, and the flavorful meats that Chipotle has to offer. Comparing Chipotle to Moe’s is like comparing Nike to Skechers, USA to North Korea, the Patriots to the Browns, Supreme to Palace or even Apple to Android. In the yellow-themed, free-chips corner, we have Ike Bryant defending Moe’s. Moe’s is by far the better choice of Southwestern cuisine. First off, it is a cheaper option. Not everybody has the ability to spend more money on food of lower quality. That is why the average Moe’s is exceedingly more successful than the average Chipotle. While Chipotle has 2,205 locations compared to Moe’s 680-700, they only rack in twice the annual revenue. This means that three Chipotles make as much as two Moe’s, which shows how notably more popular Moe’s is. Another of Moe’s assets that tops Chipotle is the taste of their food. While Chipotle may have better chips than Moe’s, they have nothing good to dip them in. Moe’s queso far surpasses Chipotle’s. The blend of three cheeses, diced jalapeños, and the creaminess all distract you from the below standard chips, which really aren’t all that bad. Moe’s entrees are much more desirable than Chipotle’s, including their burritos, stacks, tacos, quesadillas, and nachos. While the Moe’s burritos may be a slight bit smaller, they make up for the small lack of space with adding the highest grade ratio of ingredients, while Chipotle unevenly piles their ingredients onto a tortilla. Quality is always much better than quantity, and that is the difference between Moe’s and Chipotle burritos; who wants to bite into a messy burrito and take a large bite of tortilla and guacamole, expecting meat, beans, rice, cheese and more? 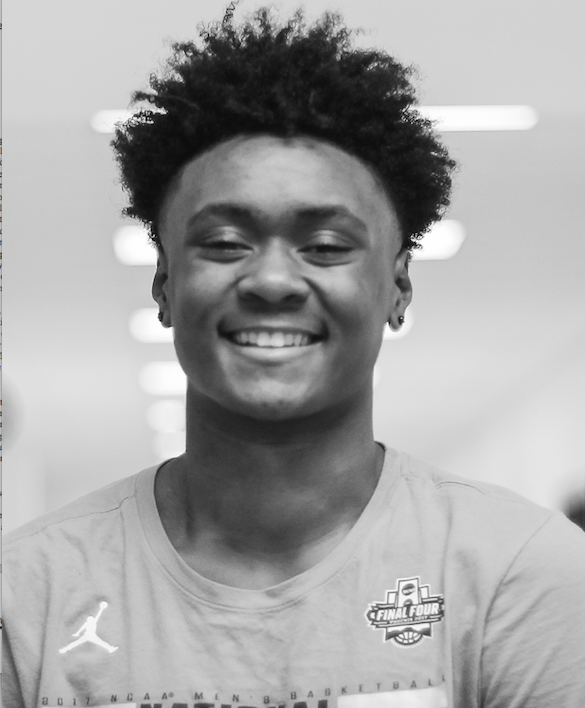 According to Jonathan Osborne, a sophomore at Carrboro High School, I’m not the only one who likes Moe’s better than Chipotle. “The queso is better, more flavorful, and all of the foods in general are more flavorful and have a better quality. The meats are so much better including the steak and ground beef, and the rice is much better,” said Osborne. Osborne’s favorite meal to order at Moe’s is the Wrong Doug, which he simply describes as “perfect.” The Wrong Doug is one of Moe’s stacks, and it perfectly balances the flavors of meat, cheese, beans, queso, lettuce and pico de gallo in between two crunchy corn shells and two grilled tortillas. The final benefit of Moe’s is the restaurant itself. “Welcome to Moe’s!” is the first thing you hear when you walk into one of the restaurants. Moe’s creates a homey environment that makes everyone feel welcome when they eat there, and lets you efficiently watch your meal being made in front of you. Moe’s styles their restaurants to be like the rebellious spirits of the 70’s, 80’s, and 90’s. Their name literally stands for Musicians, Outlaws, and Entertainers, and it attempts to revisit the popular culture of those generations. Even if it’s not your style, they make up for it with their phenomenal food. With the combination of their food, atmosphere and success, Moe’s is overall the better restaurant to dine at for Southwestern cuisine. While Chipotle boasts about the freshness of their ingredients, they sure don’t boast about the sixty cases of E. coli across eleven states that they served through their “quality food” to customers. The next time you think of going to Moe’s or Chipotle, just remember: quality always beats quantity. Hamburgers. Hot dogs. Cookouts. ‘Merica. It’s no secret that meat is a staple of the American nation; walk into any restaurant and you’re guaranteed a dish fit for a carnivore. With over 96 percent of the United States population identifying as meat-eaters, and a culture that encourages meat consumption at every turn, a meat-inclusive diet is seen as the standard — and why wouldn’t it be? Ask any meat-eater and they cite it as an integral food group in a human diet. We’ve all heard about the nutritional benefits of meat since childhood, yet rarely ask ourselves, from where? The American Cancer Society, American Diabetes Association and the American Heart Association all encourage meat consumption in a diet aimed to combat their respective illnesses. These organizations fund, organize and promote the blueprints for healthy diets nationwide—many of which are taught in public school health classes. Children grow up under the guise that these organizations are well-intentioned and credible, despite the fact that groups like the World Health Organization have classified some types of meat as top-tier carcinogens—on par with tobacco in terms of cancer-causing elements. The American Journal of Clinical Nutrition says that one serving of processed meat a day increases your risk of developing diabetes by 51 percent, and the Physician’s Committee for Responsible Medicine identifies chicken as the number one source of cholesterol in the American diet. Why would these medical organizations promote foods that cause the diseases they fight to prevent? The answer lies in their corporate partners. All three of these organizations get a considerable amount of funding from the leading meat production companies. Tyson foods, Conagra, Cargill and countless other corporations constantly pump money into the groups that provide this nutritional “education,” in exchange for the worldwide promotion of their products. But sadly, as appalling as the corporate influence on health organizations may seem, it is far from shocking. Our national food culture is built on the consumption of meat—and clearly not because of its nutritional benefits. Animals are easy to control, house, slaughter, package and export to your favorite restaurants. McDonalds, Burger King, Chick-fil-a and Taco Bell have been among the most successful fast food chains since their inception, and vegetarians are kidding themselves if they think that it’s possible for the whole world to go plant-based. The meat industry dominates our food system in a terrifying way; poor people have very little choice when it comes to eating foods that are likely to cause them health problems down the line. It’s no accident that the leading meat production companies are heavily sponsored by top pharmaceutical industries. Hmm. Lest you forget, everything in the Land Of The Free And The Home Of The Brave is a business. The pipeline from pharmaceutical companies, to meat companies, to medical “organizations” is just another profit-driven system. Going vegetarian is just one simple step to a long road of resistance. And truly, this systematic manipulation of an uneducated populace is a staple of the American nation. Corporatism. Deception. Meat. Money. ‘Merica. Many people try to dissuade meat-eaters by telling us that eating meat is unhealthy for the environment. While in some cases they aren’t wrong, vegetable production and consumption can be worse than that of meat. A study in 2015 by Carnegie Mellon University has backed that eating lettuce is over three times worse in greenhouse gas emissions than bacon. This means that the emissions for someone’s crisp, “healthy” salad is more than my greasy pile of bacon. Other evil vegetarians will try to attack the meat lovers by saying that it’s unethical to consume another breathing organism, but there are no tigers in nature thinking, “Wow, it’s morally wrong for me to eat this elephant.” So why is it wrong for humans to eat animals that we find tasty? It’s all part of the food chain, and we’re the consumers. hile I don’t condone the extremely harsh treatment of livestock raised for food, there are many companies that raise animals in humane conditions on farms. Some companies, like Kobe-Niku in Japan go as far as massaging their cattle daily and playing classical music as a means of relaxation. While I would never bash someone for being a vegetarian, there are many valid reasons for why meat eating is the best. The first being that I simply enjoy it. It tastes good. Every time I hear the sound of a pan searing a steak, I break into my DJ Khaled “Wild Thoughts” dance. I’ll also continue to protect the omnivore lifestyle because some individuals need to eat meat to supplement their nutrition. For example, people with chronic or severe anemia need meat to retain their hemoglobin levels because they don’t get enough iron from other sources such as beans and leafy vegetables. We also need meat to gain healthy weight and stay physically stable. Especially for my people out there trying to get those gains. A way to solve the everlasting “beef” between vegetarians and normal people is an easy one. Y’all do y’all, and we’ll do us. No pictures or facts about being a vegetarian — I don’t care. And for my meat-eating family: do your research! While eating meat is the correct way to live life, supporting companies who treat animals like meaningful creatures goes hand in hand. By supporting humane companies and local meat markets, you can sleep at night knowing that you’re doing the right thing. Has Apple lost their X-factor? Ah, the age-old debate: Apple versus Android — or, in this case, Samsung. It’s never been a hard choice. On the one hand, you have the lawless, fragmented, half-baked ecosystem that are Samsung Galaxy phones. On the other, you have the perfect meld of flawless industrial design and smart, forward-thinking software: the iPhone, by Apple. There’s simply never been a compelling reason to buy Samsung’s flagship smartphones over Apple’s. There isn’t a big price advantage, if one at all. They offer very little advantage in technical specifications; the camera, processor, and memory are all inferior to those of iPhones. The defining feature of Samsung phones — their oversaturated and overly-bright displays — lack the color accuracy of iPhone displays. iPhones, on the other hand, are built better. They are more durable, have better cameras, faster processors, more accurate screens and make more efficient use of memory. They will always be updated with the latest iOS — something that Android users can’t say about their phones. On a basic level too, Apple outdoes Samsung. The two companies have fundamentally different structures on which they build their phones; Apple develops the entire phone — software and all. Samsung, however, is only free to develop the hardware — the software is then ported in from Google’s developers. This gives Apple the advantage in that they’re able to develop software that is purpose-built for their phones and which leverages every bit of their power. Additionally, this makes it quite easy for Apple to push constant updates to all of their phones. The software that runs on Samsung phones — Android — is inferior as well; the operating system is convoluted and complex to the point of being unusable. It slows at the simplest tasks. Its only advantage over iOS is the way that it handles notifications; grouping by app is a fantastic idea. 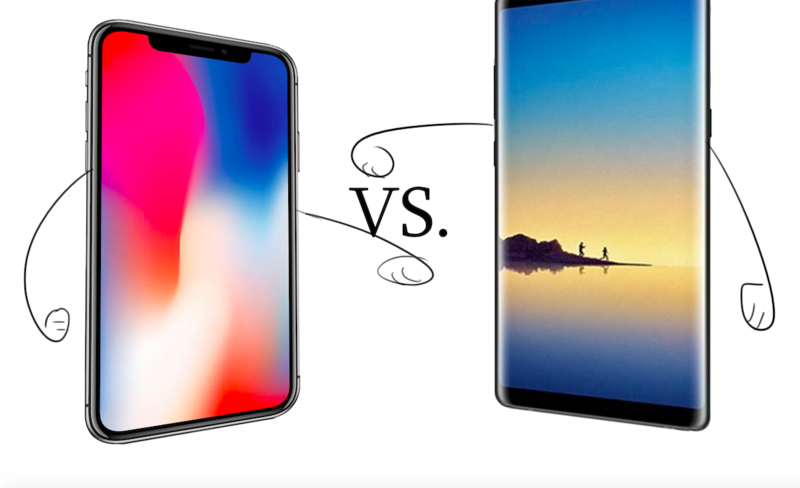 In summary, then, the choice between Apple and Samsung is a choice between the most streamlined and complete meld of hardware and software that the tech world has ever seen — the iPhone — and a mish-mash conglomeration of inferior hardware and outdated, slow and inferior software. The question of whether you should choose an Apple or Samsung phone is easy to answer. On one hand, you have the restricting, unimaginitive, uniform and fragile device that comes from Apple. Alternatively, you have the sleek, inventive, powerful and customizable device that comes from Samsung. Let’s compare the most recent phones released by the two companies: Apple’s iPhone X and Samsung’s Note 8. I think it should be clarified that Apple’s iPhone X’s OLED display is made by Samsung, their competitor. However, even with the same display, the Note 8’s 6.3-inch screen is larger and has brighter colors. Apple also states that the iPhone X is “all-display,” but in reality it is not; there’s that annoying black notch at the top, which makes streaming videos awkward unless you change the video display settings. Samsung doesn’t have that notch, so you can binge-watch shows without disturbance. You know what else is disappointing about Apple’s recent devices? There’s no headphone jack. Though this is a good way to increase airpod sales, it still leaves most iPhone users unsatisfied. With Samsung’s devices, you don’t have to worry about losing your expensive airpods, stick with regular earbuds. The iPhone X and the Note 8 both contain dual twelve-megapixel cameras. However, when taking portraits, only the Note 8 can take both a portrait and a wide photo at once. In addition, Note 8’s camera is flat on the back of the phone and doesn’t cause the phone to wobble without a case when its lying on a flat surface. Samsung also triumphs when it comes to multitasking since all of its devices, since 2014, have split-screen: the ability to easily use two apps at once. Apple finally incorporated wireless charging into their new device this year, but that’s still two years later than Samsung, which has had wireless charging on all devices dating back to the Note 5. Samsung is also the only company out of the two that currently sells wireless charging docks. Phones aren’t the only area in which Samsung sweeps the floor, as the company is much bigger than Apple. According to Business Insider, as of February 2017, Apple has stores spread across nineteen countries; Samsung occupies more than four times that number. As a bigger company that has much more experience, Samsung very clearly surpasses Apple both in the world of technology and design, and the world of business and marketing. When faced with the choice between an iPhone or a Samsung device, the obvious choice is Samsung. Their devices have the same features plus some more, which perform better than those of Apple, for the same price. I like this boy, but I’m too scared to say anything because I am really shy. I’m pretty sure he doesn’t even know I exist. Anyway, I really need advice, because I have liked him since second grade. 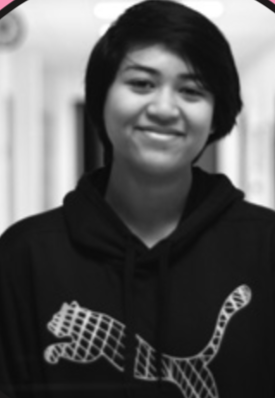 I’m a senior now, and I want to just go for it! But like, yikes! Help me! Aw, honey; don’t overthink this! I don’t even know who you are, but I bet any guy would be lucky to have you. And remember: it’s 2017! Girls can make the first move! If you’ve liked this boy since second grade, and now it’s senior year, my best suggestion is to form a friendship and see how things play out. High school is a very stressful time for young adults, and with all the school dances and happy couples, you might feel pressure to get a boyfriend, but trust me, sweetie: boys aren’t everything. You don’t need a man to make you happy! That being said, remember that if you don’t ask him out, you basically guarantee y’all won’t get together. Senior year is a time to have many adventures, sleepovers, late night talks with your best friend and to just live your life to the fullest. A year from now, you won’t be able to make these memories again. How do I juggle all my commitments junior year without overdoing it and while still making time for friends and family? Also, how do I know when to sign up for everything that I need to apply to college, like ACT/SAT sessions, tutoring, scholarships, etc? Junior year is hard, but it’s not the end of world. Remember to take time for yourself. Perhaps you can set aside at least 30 minutes after school to listen to some music or eat your favorite food. Or you can try to eat dinner with your family whenever possible; dinner is a great time to take a break from work and have a nice conversation with your loved ones. Balancing everything that life throws at you will be hard and very stressful at times, but trust me: it gets better. The best advice I can give you is explore the websites of the colleges you’re planning to apply to. Try to understand exactly what your top college choices expect from you — try making a checklist! Also, listen to your teachers because, believe it or not, they have your best interests at heart. Finally, those emails from colleges you might disregard can actually be chock full of information on upcoming visits and information on how to apply.